No More Drama is the fifth studio album by American R&B recording artist Mary J. Blige. The album was released on August 28, 2001 by MCA Records in North America. The album was certified 3x Platinum. According to Billboard magazine, No More Drama has sold over 3,200,000 in the United States alone to date. Critically acclaimed, the album has received positive to favorable reviews from most music critics, debuting at number two on the US Billboard 200, and opening at number one on the Top R&B/Hip-Hop Albums chart, selling 324,000 copies in its first week. It has spawned four singles that has attained Billboard chart success. The album received two Grammy nominations for Best R&B Album and Best Female R&B Vocal Performance (for "Family Affair") at the 44th Grammy Awards. Blige would win her first in the latter category for the track "He Think I Don't Know" the following year. The inspiration for No More Drama came largely from Bilge's own confused and hectic life. In a later interview she confessed to living a life of alcohol and drug abuse at the time, and as a result getting involved in a series of abusive relationships. The album was an attempt to break free from this vicious circle, which was a result of a deprived childhood. Stylistically, the album diverged from Blige's typically blues-soaked R&B into the hip-hop beats and influences that had made her debut, What's the 411?, a hit. This is especially evident in the first single, "Family Affair". Rapper Eve appears on the track "Where I've Been" as well, and urban influences can be heard throughout the album. Early in its development, the album carried the full title Mary Jane - No More Drama and was to be a sequel to 1999's Mary. Blige's then-manager hinted that the album would be the second in a trilogy and be followed by an album titled Mary Jane Blige. During this time, the first single was supposed to be a song called "Rock Steady" featuring a rap from Jay-Z and Lenny Kravitz on guitar. The song was leaked to mixtapes months before the album was scheduled to be released and subsequently did not make the final cut on the album. No More Drama received generally positive reviews from critics. At Metacritic, which assigns a normalized rating out of 100 to reviews from mainstream publications, the album received an average score of 77, based on 12 reviews. AllMusic editor Liana Jonas complimented Blige's ability to write relatable lyrics, writing that she "has a killer instinct for creating gritty, thick, and soul-infused R&B fare. Her music is more than heard. It is felt, and audiences would be hard-pressed to not surrender to her groove." Writing for The A.V. Club, Nathan Rabin believed "Blige sounds happier and more relaxed than ever. Boasting nearly as many producers as songs, No More Drama [is] a testament to Blige's force of personality and the authenticity of her vision that the disc feels as personal and intimate as the most heartfelt four-track demo." Entertainment Weekly's David Browne felt that "from the Dre-produced theatricality of the single ”Family Affair” to refined funk and crisp quiet-storm R&B, the multi-producer arrangements are expansive yet warm, and Blige’s pushy rasp has never sounded better." Robert Marriott from Rolling Stone said the record "presents Blige more in touch with her roots, more grounded and ready for her next set of challenges, musical and otherwise, an analog soul thriving in a digital age." Barry Walters from The Village Voice called it "Blige's most rhythm album ever, and even the ballads that can drag r&b down here bristle with bumping beats." "Flying Away" contains a sample from "God Bless You" (1979), written by Sting and performed by The Police. ↑ Brown, Helen (2008-07-02). "Mary J Blige: Proud to shout it out without selling out on 'Growing Pains'". The Daily Telegraph. Retrieved 2009-07-21. ↑ Reid, Shaheem (2001-04-03). "Mary J. Blige Wants 'No More Drama' On Fifth LP". MTV.com. Retrieved 2009-02-24. ↑ "Blige May Cut Leaked Jay-Z/Kravitz Track From Album". MTV News. ↑ "All Music Guide to Soul: The Definitive Guide to R&B and Soul". Google Books. 1 2 Jonas, Liana. "No More Drama". Allmusic. Retrieved 2009-07-21. ↑ Christgau, Robert (n.d.). "Consumer Guide Album: No More Drama". Robert Christgau. Retrieved October 1, 2016. ↑ Larkin, Colin (2011). "Mary J. Blige". The Encyclopedia of Popular Music (5th ed.). Omnibus Press. ISBN 0857125958. 1 2 Browne, David (2001-09-07). "No More Drama (2001)". Entertainment Weekly. Time Inc. Retrieved 2016-08-22. ↑ "Choices From the Charts". Los Angeles Times. Tronc, Inc. 2001-11-22. Retrieved 2016-08-22. ↑ Ward, Christian. "Blige, Mary J: No More Drama". NME. Time Inc. UK. Retrieved 2016-08-22. ↑ "Reviews". Q. October 2001. p. 117. 1 2 Marriott, Robert (2001-08-20). "No More Drama". Rolling Stone. Retrieved 2009-07-21. ↑ "Reviews". Uncut. November 2001. p. 102. ↑ Jones, Steve (2001-08-28). "Pick and choose from Blige, Scruggs and friends". USA Today. Gannett Company. Retrieved 2016-08-22. ↑ "Critic Reviews for No More Drama". Metacritic. Retrieved 2012-08-20. ↑ Rabin, Nathan (2001-08-28). "Mary J. Blige: No More Drama". The A.V. Club. The Onion. Retrieved 2016-08-05. ↑ Walters, Barry (2001-09-04). "Marked Woman". The Village Voice. The Village Voice LLC. Retrieved 2016-08-22. ↑ Christgau, Robert (2003-09-23). "The Commoner Queen". The Village Voice. Retrieved 2012-08-20. ↑ Christgau, Robert (September 18, 2001). "Consumer Guide". The Village Voice. Retrieved October 1, 2016. ↑ Brown, Ethan (August 27, 2001). "Ladies Sing the Blues". New York. Retrieved October 1, 2016. 1 2 D'Angelo, Joe (2002-02-06). "Mary J. 's Reissue The Only 'Drama' In Stagnant Billboard Top 10". MTV News. Viacom. Retrieved 2016-08-22. 1 2 Farber, Jim (2001-09-06). "Aaliyah Surges To No. 1 Album". New York Daily News. Mortimer Zuckerman. Retrieved 2015-07-21. ↑ D'Angelo, Joe (2003-09-03). "Mary J. Blige, Hilary Duff Take Over Top Slots On Albums Chart". MTV News. Viacom. Retrieved 2016-08-22. ↑ "Mary J. Blige: Love & Life". Billboard. Prometheus Global Media. 2003-08-09. Retrieved 2016-08-22. ↑ "Mary J. Blige". Fan of Music. Retrieved 2009-07-21. ↑ "Australiancharts.com – Mary J. Blige – No More Drama". Hung Medien. Retrieved 2016-08-19. ↑ "Austriancharts.at – Mary J. Blige – No More Drama" (in German). Hung Medien. Retrieved 2016-08-19. ↑ "Ultratop.be – Mary J. Blige – No More Drama" (in Dutch). Hung Medien. Retrieved 2016-08-19. ↑ "Ultratop.be – Mary J. Blige – No More Drama" (in French). Hung Medien. Retrieved 2016-08-19. ↑ "Mary J. Blige – Chart history" Billboard Canadian Albums Chart for Mary J. Blige. Retrieved 2016-08-19. ↑ "Danishcharts.com – Mary J. Blige – No More Drama". Hung Medien. Retrieved 2016-08-19. ↑ "Dutchcharts.nl – Mary J. Blige – No More Drama" (in Dutch). Hung Medien. Retrieved 2016-08-19. ↑ "Lescharts.com – Mary J. Blige – No More Drama". Hung Medien. Retrieved 2016-08-19. ↑ "Longplay-Chartverfolgung at Musicline" (in German). Musicline.de. Phononet GmbH. Retrieved 2016-08-19. 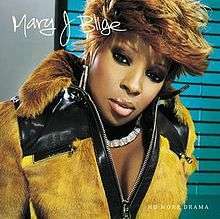 ↑ "Italiancharts.com – Mary J. Blige – No More Drama". Hung Medien. Retrieved 2016-08-19. ↑ "Charts.org.nz – Mary J. Blige – No More Drama". Hung Medien. Retrieved 2016-08-19. ↑ "Norwegiancharts.com – Mary J. Blige – No More Drama". Hung Medien. Retrieved 2016-08-19. ↑ "Official Scottish Albums Chart Top 100". Official Charts Company. Retrieved 2016-08-19. ↑ "Swedishcharts.com – Mary J. Blige – No More Drama". Hung Medien. Retrieved 2016-08-19. ↑ "Swisscharts.com – Mary J. Blige – No More Drama". Hung Medien. Retrieved 2016-08-19. ↑ "Mary J. Blige | Artist | Official Charts". UK Albums Chart Retrieved 2016-08-19. ↑ "Official R&B Albums Chart Top 40". Official Charts Company. Retrieved 2016-08-19. ↑ "Mary J. Blige – Chart history" Billboard 200 for Mary J. Blige. Retrieved accessdate=2016-08-19. ↑ "Mary J. Blige – Chart history" Billboard Top R&B/Hip-Hop Albums for Mary J. Blige. Retrieved accessdate=2016-08-19. 1 2 "Jaaroverzichten 2001". MegaCharts (in Dutch). Hung Medien. Archived from the original on 2012-07-15. Retrieved 2016-08-27. ↑ "Classement Albums – année 2001" (in French). Syndicat National de l'Édition Phonographique (SNEP). Retrieved 2016-08-27. ↑ "Årslista Album – År 2001". Swedish Recording Industry Association. Retrieved 2016-08-27. 1 2 "Jahrescharts 2001". Swisscharts.com. Hung Medien. Retrieved 2015-10-10. ↑ "2001 UK Albums Chart" (PDF). ChartsPlus. Retrieved 2015-01-01. ↑ "2001 Year-End Chart – Billboard 200". Billboard. Prometheus Global Media. Retrieved 2014-06-30. ↑ "2001 Year-End Chart – Top R&B/Hip-Hop Albums". Billboard. Prometheus Global Media. Retrieved 2014-06-30. ↑ "Classement Albums – année 2002" (in French). Syndicat National de l'Édition Phonographique (SNEP). Retrieved 2016-08-27. ↑ "2002 UK Albums Chart" (PDF). ChartsPlus. Retrieved 2015-01-01. ↑ "2002 Year-End Chart – Billboard 200". Billboard. Prometheus Global Media. Retrieved 2014-06-30. ↑ "2002 Year-End Chart – Top R&B/Hip-Hop Albums". Billboard. Prometheus Global Media. Retrieved 2014-06-30. ↑ "Canadian album certifications – Mary J. Blige – No More Drama". Music Canada. Retrieved 2016-08-19. ↑ "French album certifications – Mary J. Blige – No More Drama" (in French). Syndicat National de l'Édition Phonographique. Retrieved 2016-08-19. ↑ "Guld- och Platinacertifikat − År 2001" (PDF) (in Swedish). IFPI Sweden. Retrieved 2016-08-19.